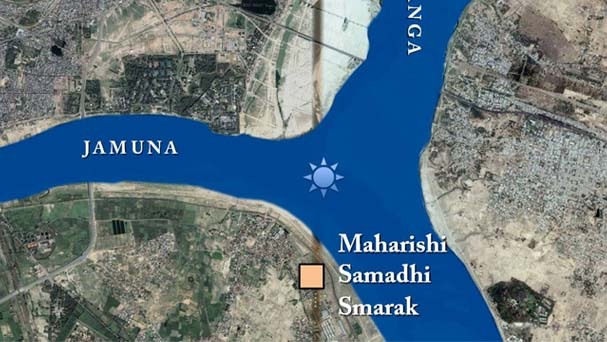 The Maharishi Smarak is located in the ancient city of “Prayag” (Allahabad) at the highly auspicious and sacred Triveni Sangam, the confluence of the three most holy rivers in the world—Ganga, Yamuna, and Saraswati. The Triveni Sangam in Prayag is the most frequently visited and supreme pilgrimage site of all time and the location of the highly auspicious Melas (spiritual fairs). The greatest Mela, the Maha Kumbha Mela is celebrated here every 144 years. During the most recent Maha Kumbha Mela in 2001, more than 60 million people gathered at this very site, making it at the largest gathering anywhere in the world, ever recorded in history. This deeply spiritual location is the perfect site for the Maharishi Smarak, as it was Maharishi Mahesh Yogi who came out of the Himalayas to spiritually regenerate the whole human race. Here in Prayag, at the highly visible Maharishi Smarak, millions of seekers of truth will bask in Maharishi’s Total Knowledge presented on marble panels that grace the walls of the Hall of Silence. Entertaining, state-of-the-art digital exhibitions will be presented in Maharishi Mandaps that line the grand promenade leading from the banks of the Ganga up to the Hall of Silence. The Maharishi Smarak will be a heavenly attraction to the millions of people who come to Prayag in devotion and reverence to receive the blessings of the Divine.